The player missed the county’s previous encounters with Derry and London through injury. Jason McLoughlin is set to return from injury this Sunday. JASON MCLOUGHLIN HAS been named in the Cavan side for Sunday’s All-Ireland quarter-final with Kerry. The player missed the county’s previous games with Derry and London through injury, but is back for this weekend’s all-important game. Kerry have already named their side to face Terry Hyland’s men. Cavan (XV to face Kerry): Alan O’Mara (Bailieborough Shamrocks); Thomas Corr (Denn), Rory Dunne (Redhills), Killian Clarke (Shercock); Jason McLoughlin (Shannon Gaels), Alan Clarke (Kingscourt) Captain, Ronan Flanagan (Castlerahan); Damien O’Reilly (Belturbet), David Givney (Mountnugent); Cian Mackey (Castlerahan), Jack Brady (Ramor United), Feargal Flanagan (Butlersbridge); Martin Reilly (Killygary), Martin Dunne (Cavan Gaels), Eugene Keating (Saint Sylvesters). Email “McLoughlin returns to Cavan side for All-Ireland quarter-final”. 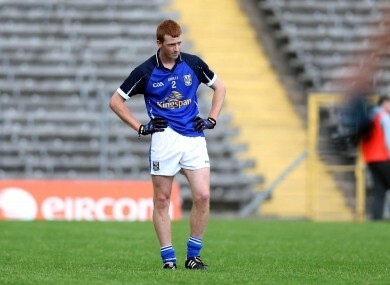 Feedback on “McLoughlin returns to Cavan side for All-Ireland quarter-final”.